In Part 2 of our series on child safety restraints, it’s time to ponder some of the other vexing questions which arise – inside the vehicle – as your child grows from baby, to toddler, to preppie and beyond. So what do mums and dads really want to know? How do I correctly adjust the child seat and straps? 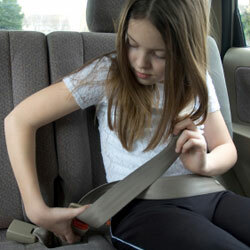 Make sure the shoulder straps are flat against your child’s body, from above the shoulder right down to the buckle. It’s always worth checking under the shoulder pads for hidden twists. And harness straps should be firmly fitted – not too tight, not too loose. Check that you can fit no more than two fingers between the strap and your child’s body. How do I correctly fit the seat in my car? Always use the proper anchor points. Some seats do not have anchor points, and parents have been known to attach the restraint’s tether strap around the head rest or luggage rails; or simply thread the car’s normal seat belt through the back of the seat to hold it in place. You might get away with this in normal driving, but there’s no way it will hold during a crash. If you need anchor points, take your car to the dealership or a restraint fitting station to get the right ones fitted. If you need help, don’t just guess! Ask the people who know and get it right first time. Can my child travel in the front seat? While the back seat of the car is the safest place for all children to sit, there are instances when children are allowed to travel in the front seat. Until your child turns four, he must be in a suitable child restraint in the back seat, if your car has two or more rows of seats. Between the ages of four and seven, your child must not sit in the front seat unless all the other seating positions in the car are taken by children under seven years old in suitable child restraints or booster seats. If your vehicle has only one row – for instance, a single cab ute – a rearward-facing restraint can be used in the front, but only in the absence of an airbag. Forward-facing child restraints and booster seats can be used in the same instance with an airbag, but recommendation is that the seat be moved back as far as possible, away from the airbag itself, to reduce the risk of suffocation in an accident. When my child turns seven, can they start using an adult seat belt? Yes, although an adult lap-sash seatbelt is designed for people with a minimum height of 145cm. The average child only reaches this height between the ages of ten and twelve. A booster seat is recommended until your child outgrows it, and some boosters are designed for children up to the age of ten. Does my child need a restraint in a Taxi or Bus? Legally, no. A bus of 12 seats or more is exempt from restraint rules. If a taxi does not have the proper child restraint, a taxi driver is exempt from any requirements to restrain children. It’s your right, however, to provide and fit a proper restraint in either of these cases; and children should use seatbelts as a minimum requirement. If a minibus has fewer than 12 seats, including the driver, then any children under the age of 7 years must use an appropriate child restraint or booster seat. If your growing family needs a bigger vehicle, why not get some expert help to sell your car? And watch out for Part 3 of our series, aimed at helping you choose the best and most appropriate child restraint.